In 1855 Isaac Piser, a pedlar, lived downtown at 156 Leonard St. One can't be sure, but Isaac Piser, the pedlar, might be the same Isaac Piser recorded in the 1870 U. S. Census as age 49, born Prussia, "Interpreter in Court." Isaac Piser's son, Abraham Piser, was 19 in this census and was a "Clerk in Broker's Office." The family lived in Manhattan's Ward 12, which in 1870 was Manhattan north of 86th Street. 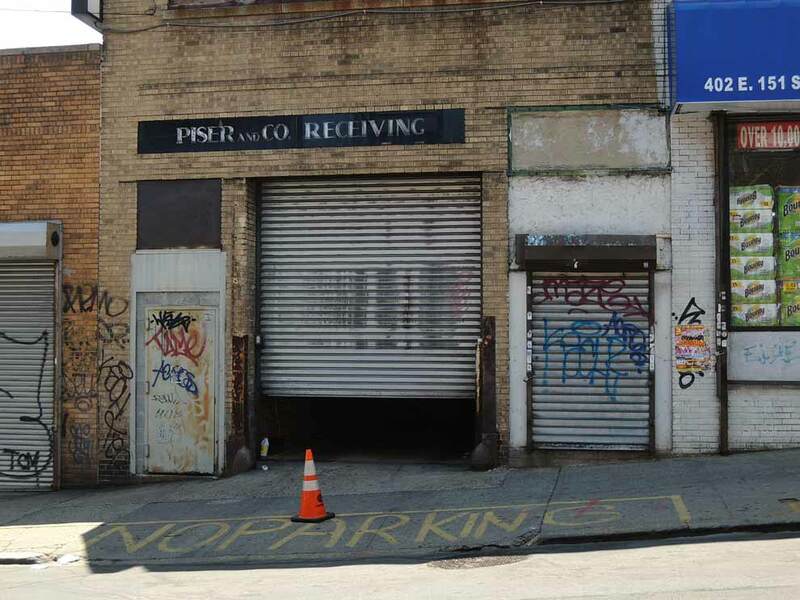 Not long after this date, Abraham Piser was listed in city directories as a dealer in fancy goods, millinery and dry goods at 2235 Third Avenue, the Bronx, near 135th Street. Abraham Piser (1850-1909) was also in business downtown in Manhattan on the Bowery and Elizabeth Street as a clothing merchant. From 1888 to 1890 he was in partnership with Jacob Harris as Piser & Harris, as described in this story about the business' failure in 1890, "Abraham Piser and Jacob Harris, composing the firm of Piser & Harris, dealers in clothing, dry goods, furniture, carpets, and household effects, for cash and on the installment plan, at 132 Bowery and 2,731 Third Avenue, made an assignment yesterday to Charles Lyon without preference. The present firm was established July 16, 1888, Mr. Piser having previously been in the fancy goods business in Third Avenue, Harlem, for fourteen years. ... The failure was precipitated by an attachment for $778 obtained Saturday. ..." (New York Times, 24 June 1890, pg. 9). Abraham Piser next appears as a furniture dealer at 2882-2884 Third Ave., and this was the origin of Piser & Co., Furniture, located across the street at 2887 Third Avenue (near 150th Street) from 1910 to 1996. From 1907 to 1914 Abraham Piser's second wife, Susan (Susie) E. Piser (nee Reilly) (1860-1919), was listed as an officer at Piser & Co. on Third Avenue. She appears in the 1910 U. S. Census, age 50, as "Proprietor, Furniture Store," living at the Piser family home, 762 Union Avenue, the Bronx. A headstone at Old Saint Raymonds Cemetery, the Bronx, is inscribed "Erected by Susie E. Piser." Listed as president of Piser & Co. in 1913 was Jacob (Jack) Selig (1872-1951). Selig appears in the 1920 U. S. Census, age 37, born Germany, "Merchant, Dept. Store," living at 301 West 91st St., Manhattan. When he applied for a passport in 1921 Selig specified that he was born Bavaria, Germany, 29 August 1872, that he emigrated to the U. S. from Bremen 10 Sept. 1889, and that he became a naturalized citizen of the U. S. 13 May 1896. He lived at the time at the Ansonia Hotel, Broadway and 73rd St.
Selig's obituary in the New York Times, 11 June 1951, pg. 25, read, "Jack Selig, chairman of the Piser Furniture Company's board, died yesterday at his home, 160 Central Park South in his seventy-eighth year. He had been active in many philanthropic groups. Mr. Selig came here in 1889 from Wurzburg, Bavaria, his birthplace. At the age of seventeen he began work as a parcel wrapper in Ludwig Brothers Department Store at $4 a week. After several promotions and buying for eleven departments, Mr. Selig became secretary and director of Rothenberg and Company, successor to Ludwig Brothers. He resigned in 1911 while vice president and later in the same year he purchased the Piser company. Mr. Selig was one of the founders of the Federation of Jewish Charities and the United Jewish Appeal. He was vice president of the Bronx Young Men's and Young Women's Hebrew Association and a director of the Bronx Society for the Prevention of Cruelty to Children, a director of the Bronx Boy Scouts, a charter member and director of the Bronx Rotary Club, and a 'Christmas Daddy' for the New York Institute for the Education of the Blind. In 1948 he received the institute's Braille Medal for outstanding service to the blind. He was a member of the Mayor's Committee for many years, and a director of the Associated Furniture Dealers of New York and the National Retail Furniture Association. A son, Richard F. Selig, and a daughter, Nannette, both of New Rochelle, and two grandchildren survive." Jacob Selig's son, Richard F. Selig (1909-1970), was also a president of Piser & Co. at a later date. Richard F. Selig's obituary in the New York Times, 5 August 1970, pg. 35, read, "White Plains, Aug. 4 - Richard F. Selig, chairman of the board and president of Piser Furniture Company, at Third Avenue and 150th Street in the Bronx, died of a heart attack Sunday at White Plains Hospital. He was 61 years old and lived in Mamaroneck. Mr. Selig was co-founder and director of the Merchants' Service Bureau and past president of the Bronx Rotary Club. He was director of the Bronx Society for the Prevention of Cruelty to Children and the Bronx Young Men's Hebrew Association. Survivors include his widow, Nannette; two sons, Richard Jr. and John, and four grandchildren." Another of Jacob Selig's sons, John J. Selig, Jr. (1907-1945) was also employed at Piser & Co.
Another figure at Piser & Co. was Abraham Lincoln Werner (1874-1945). Abraham L. Werner, a bond salesman, investor, and clothing and textile manufacturer, was secretary at Piser approximately 1915 to 1925. He registered for the World War I draft in 1918 when he was employed in "Cotton Converting & Real Estate, Potter Textile Co., Arden Mills Inc., & others" His 1924 passport application specified that he was born 13 June 1874 in New York. He retired from business in 1929 and died in 1945. Werner's obituary in the New York Herald Tribune, 28 April 1945, pg. 12, read, "Abraham L. Werner, retired clothing and textile manufacturer and father of Major Robert L. Werner, an Assistant United States Attorney from 1937 until 1941, died Thursday at Roosevelt Hospital, Ninth Avenue and Fifty-ninth Street. He was seventy years old and lived at 40 East Sixty-sixth Street. A native of New York, Mr. Werner established the clothing manufacturing firm of A. L. Werner Company in 1895. He discontinued this business thirty years ago. Later he became president of Potter Textile Company, Crescent Holding Corporation, and Reuresco Realty Company. He retired in 1929. Surving, besides Major Werner, now in Europe with the Army Air Forces, are his wife, Mrs. Elsa Ludwig Werner; another son, Steven L. Werner; a sister, Mrs. Hugo Oppenheim, and two brothers, Jack and Hyman Werner, all of New York." NYPL's Digital Collections include a sign for Piser's located on Third Avenue between 163rd and 164th Streets, several blocks north of the store's location.